The Orange-Ulster Health Plan is a Plan of choice. The OU Plan utilizes a hospital and facility network through Blue Cross/Blue Shield. 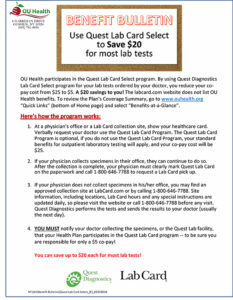 You can find a participating provider at www.bcbs.com Find a Doctor or Hospital Member ID = OUH. Some Providers are part of a network of providers who have agreements with the Plan to accept certain payment for services. These are called In-Network providers. Professional Providers who do not have agreements with the Plan to accept certain payment for services are considered Out-of-Network providers. Members have the choice of using either for their medical care. However, your out-of-pocket costs will differ depending upon which provider you choose. The choice of using In-Network providers would only require a co-pay as the In-network provider has agreed to accept certain payments for services. The choice of using Out-of-Network providers would result in meeting an annual deductible ($1,000 for Individual and $3,000 for family), paying a co-pay and co-insurance. After meeting the annual deductible, the Plan would pay 80% of the Usual & Customary (U&C) charges (co-insurance) and you would be responsible for the balance of the charges. Examples below. For additional information, see the Plan Document. If you have a hospital stay Facility fee (e.g., hospital room) $100 *$500 per admission deductible plus any charges over allowed amount. Physician/surgeon fee $25 per doctor, per visit $25 co-pay, plus deductible and 20% co-insurance to Out-of-Network maximum. *Pre-notification required for hospitalizations (except childbirth). Some of the benefits provided by the OU Plan are coordinated by managed benefit coordinators who encourage the efficient and effective use of hospital and surgical services. It is your responsibility to remember that the OU Plan contains a managed benefits component that requires you to notify the appropriate managed benefits coordinator prior to hospital admission or utilization of certain services. If you fail to notify the managed benefits coordinator when required, the OU Plan benefits may be reduced or even disallowed. For additional information on Hospital and managed benefits coordination see the Plan Document. Many of the benefits covered by the Health Plan are currently mandated by New York State Insurance Law and Regulations. If State law or regulations change, then the Plan will change accordingly. For specific coverage, please see the section Plan Document.